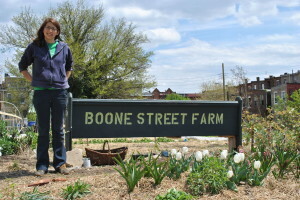 Listen in to a special broadcast of some of the “Best of” our Sound Bites series, including my interview with Wenonah Hauter, Executive Director of Food and Water Watch and author of Foodopoly: The Battle Over the Future of Food and Farming in America; our visit to the Cherry Hill Urban Garden in Baltimore; our roundtable with local farmers about why they farm; and my interview with Bryant Terry about his cookbook Afro Vegan. The premium for the second hour will be a copy of Foodopoly. Everyone interested in food and our food system will want a copy! Also in studio will be Naijha Wright of the Land of Kush restaurant. Included here is the podcast from our roundtable with small farmers, including: Denzel Mitchell, Founder and Farm Manager, Five Seeds Family Farm and Apiary; Cheryl Carmona, Co-founder of Boone Street Farm in East Baltimore; Ted Wycall third generation farmer at Greenbranch Farm in Salisbury, MD; and Carole Morrison of Bird’s Eye View Farm in Pocomoke City.